Have you read it? Post your review on Amazon, send me an email, or pop down to the Resources section! Fresh Start: 31 Days to Simplify, Declutter and Rein in the Chaos is a must-have for anyone that needs to declutter their home and simplify their lifestyle. Simplicity and green living writer Sandy Kreps offers suggestions to help you get rid of unnecessary items in your home as well as clearing out those extraneous tasks and commitments that keep you moving at a frantic pace. Sandy’s encouraging style and personal anecdotes make you feel like you’re chatting with a good friend over coffee. 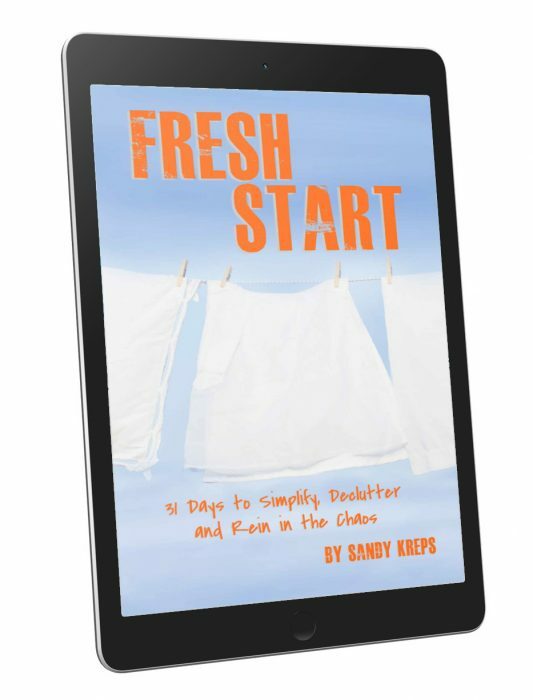 Fresh Start is a practical introduction to living with less, written by someone with a genuine passion for simplifying and living lightly on the planet. This book is available on Kindle. Don’t have a Kindle? No worries! Amazon has an app for almost every desktop, laptop, smartphone or tablet. Grab one here. The list download does not appear to be a valid pdf file. I think it may be named incorrectly, as .pdf appears twice in the name of the downloaded file. As a result, I can’t access the supplemental materials for the ebook. Also, you may want to update the link in the ebook, as it points to http://modern-simplicity.com/freshstart.